سرطان پستان رایج­ترین نوع سرطان در بین زنان است. مطالعات پاتولوژیک نشان داد­اند که بیش از80% ناهنجاری ­های پستان در مراحل اولیه خوش­خیم هستند، بنابراین مهم­­ترین مسأله در درمان آن تشخیص زودهنگام است. ترموگرافی مادون­ قرمز پستان یک روش تصویرگیری مبتنی بر ثبت الگوهای توزیع دمایی بافت پستان است و در مقایسه با ماموگرافی پستان به دلیل غیرتهاجمی، غیرتماسی، غیرفعال بودن و عدم استفاده از تابش یونیزان روشی بسیار مناسب درتشخیص زودهنگام سلول­ های سرطانی است. در این مقاله روشی به ­منظور آشکارسازی خودکار نواحی مشکوک در تصاویر ترموگرام پستان با هدف کمک رساندن به پزشکان در تشخیص زودهنگام این سرطان ارائه شده است،­ به­ نحوی که دقت و صحت را افزایش داده و درصد پذیرش اشتباه را کاهش می دهد. این الگوریتم شامل 4 بخش اصلی پردازش تصویر، استخراج ویژگی، انتخاب ویژگی و طبقه­­بندی است. در مرحله­­ی پردازش، ابتدا براساس عملیاتی تمام خودکار، ناحیه­­ی مطلوب تعیین شده، کیفیت تصاویر ارتقاء یافته و سپس پستان راست و چپ از یکدیگر جدا می­­شوند. سپس درایه­های ماتریس تصویر، نرمال­­سازی شده و نواحی نسبی مشکوک تعیین می ­شوند. پس از آن و در مرحله­ی­ استخراج ویژگی، ویژگی­­های آماری، ویژگی­­هایی مبتنی بر هیستوگرام، ویژگی­­هایی مبتنی بر ماتریس هم­­وقوعی (GLCM)، ویژگی­­هایی بر اساس مورفولوژی نواحی مشکوک و ویژگی ­هایی در حوزه­­ی فرکانس از هر یک از نواحی بخش­­بندی شده­ی پستان­ راست و چپ استخراج می­­شوند. در ادامه برای دست­یابی به بهترین ویژگی­­ها، روش­­های انتخاب ویژگی نظیر کم­ترین افزونگی و بیش­ترین ارتباط (mRMR)، انتخاب متوالی روبه جلو (SFS)، انتخاب متوالی روبه عقب (SBS)، انتخاب متوالی سیال روبه جلو (SFFS)، انتخاب متوالی سیال روبه عقب (SFBS) و الگوریتم ژنتیک (GA) به­کار گرفته می­شود. 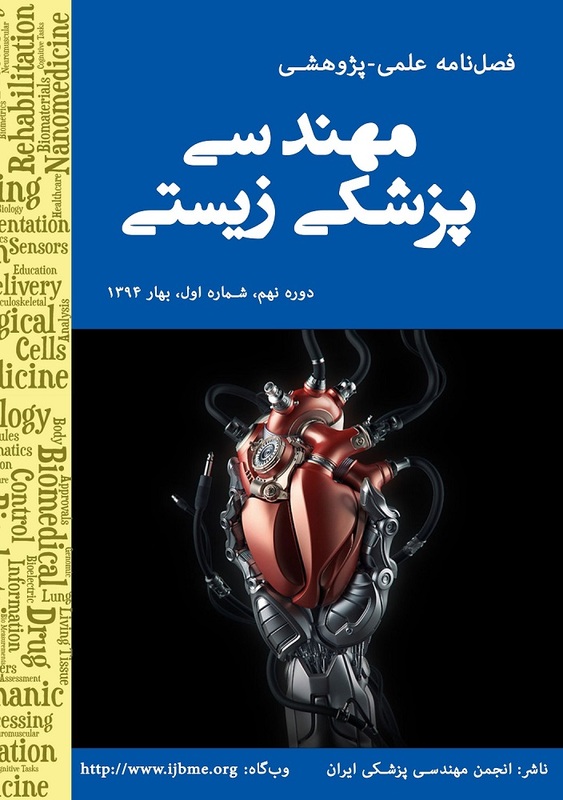 در پایان برای طبقه­­بندی و تعیین معیار استاندارد برای تحلیل دمای عروقی پستان­ها (TH)، روش­­های مختلف طبقه­­بندی مانند AdaBoost، ماشین­­های بردار پشتیبان (SVM)، نزدیک­­ترین همسایه (KNN)، بیزین ساده (NB) و شبکه­­ی عصبی احتمالی (PNN) مورد ارزیابی قرار گرفتند، تا از مناسب ­ترین آن­ها به ­منظور طبقه­­بندی ویژگی­­ها استفاده شود. نتایج به­­دست­ آمده روی پایگاه داده­­ی بومی، بیانگر ­ کارایی قابل­توجه روش پیشنهادی است. با توجه به نتایج، ترکیب mRMR با AdaBoost با بیشینه صحت 92% و ترکیب SFFS با AdaBoost با بیشینه صحت 88%، به­ترتیب بهترین ترکیبات به­­دست­ آمده روی تصاویر پستان راست و چپ ارزیابی شدند. Breast cancer is the most common type of cancer among women. The important key to treat the breast cancer is early detection of it because according to many pathological studies more 80% of all abnormalities are still benign at primary stages; so in recent years, many studies and extensive research done to early detection of breast cancer with higher precision and accuracy. Infra-red breast thermography is an imaging technique based on recording temperature distribution patterns of breast tissue. Compared with breast mammography technique, thermography is more suitable technique because it is noninvasive, non-contact, passive and free ionizing radiation. In this paper, a full automatic high accuracy technique for classification of suspicious areas in thermogram images with the aim of assisting physicians in early detection of breast cancer has been presented. Proposed algorithm consists of four main steps: pre-processing & segmentation, feature extraction, feature selection and classification. At the first step, using full automatic operation, region of interest (ROI) determined and the quality of image improved. Using thresholding and edge detection techniques, both right and left breasts separated from each other. Then relative suspected areas become segmented and image matrix normalized due to the uniqueness of each person's body temperature. At feature extraction stage, 23 features, including statistical, morphological, frequency domain, histogram and Gray Level Co-occurrence Matrix (GLCM) based features are extracted from segmented right and left breast obtained from step 1. To achieve the best features, feature selection methods such as mRMR, SFS, SBS, SFFS, SFBS and GA have been used at step 3. Finally to classify and TH labeling procedures, different classifiers such as AdaBoost, SVM, kNN, NB and PNN are assessed to find the best suitable one. The results obtained on native database showed the best and significant performance of the proposed algorithm in comprise to the similar studies. According to experimental results, mRMR combined with AdaBoost with the maximum accuracy of 92%, and SFFS combined with AdaBoost with a maximum accuracy of 88%, are the best combination of feature selection and classifier for evaluation of the right and left breast images respectively. L. Liberman, A. F. Abramson, F. B. Squires, J. R. Glassman, E. A. Morris and D. D. Dershaw, “The breast imaging reporting and data system: positive predictive value of mammographic features and final assessment categories”, AJR, Vol. 171, pp. 35 – 40, 1998. L. Liberman, “Clinical management issues in percutaneous core breast biopsy”, Radiol Clin North Am, Vol. 38, pp. 791 – 807, 2000. S. B. Fox, K. C. Gatter, R. D. Leek, A. L. Harris, J. Bliss, J. L. Mansi and B. Gusterson, “Association of tumor angiogenese with bone marrow micrometastases in breast cancer patients”, Journal of the National Center Institute, Vol. 89, N0. 14, pp.1044 – 1049, 1997. INCA, Instituto Nacional do Câncer. Available from: URL: http://www2.inca.gov.br. K. Lloyd-Williams, R. S. Handley, “Infrared thermometry in the diagnosis of breast disease”, Lancet, Vol. 2, pp.1378 – 1381, 1961. Y. R. Parisky, A. Sardi, R. Hamm, K. Hughes, L. Esserman, S. Rust and K. Callahan, “Efficacy of computerized infrared imaging analysis to evaluate mammographically suspicious lesions”, AJR, Vol. 180, pp. 263 – 269, 2003. A. Nimmi, D. Martins, D. Ruggerio, E. Tousimis, A. J. Swistel, M. P. Osborne and R. M. Simmons,” Effectiveness of a noninvasive digital infrared thermal imaging system in the detection of breast cancer”, The American Journal of Surgery, Vol. 196, No. 4, pp. 523-526, 2008. D. A. Kennedy, T. Lee, “A comparative review of thermography as a breast cancer screening technique”, Integrative Cancer Therapies, Vol. 8, No. 1, pp. 9-16, 2009. A. Drastich, “Záˇrení v lékaˇrství III. Infradiometrické detekˇcní a zobrazovací systémy”, Skripta FEI VUT v Brnˇe, 1980. R. C. Serrano, R. Lima,“Using Hurst coefficient and Lacunarity to diagnosis early breast diseases”, Proc. 17th InternationalConference on Systems, Signals and Image Processing, pp. 550-553, 2010. Fanavaran Madoon Ghermez (FMG) Co., Ltd. Available from: www.fmg-med.ir. Expanding the use ofthermalimagingin the diagnosis ofbreast cancer. Doc 002–005. W. C. Amalu, W. B. Hobbins, J. F. Head, R. L. Elliott, “Infrared imaging of the breast-An overview”, Medical Devices&Systems, The Biomedical Engineering Handbook, Edited by Joseph D. Bronzino, 3rd Eds, 2006. M. Gautherie, P. Haehnel, J. P. Walter, L. G. Keit, “Thermovascular changes associated with in situ and minimal breast cancers, Results of an ongoing prospective study after four years. The Journal of reproductive medicine, Vol. 32. No. 11, pp. 833 – 842, 1987. H. C. Peng, F. H. Long, C. Ding, “Feature selection based on mutual information: criteria of max-dependency, max-relevance, and min-redundancy”, IEEE Transactions on Pattern Analysis Machine Intelligence, Vol. 27, No. 8, pp.1226– 1238, 2005. A. W. Whitney, “A direct method of nonparametric measurement selection”, IEEE Transaction on Computers, Vol. 20, No. 9, pp. 1100 – 1103, 1971. P. Pudil, J. Novovicova, J. Kittler, “Floating search methods in feature-selection”, Pattern Recognition Letters, Vol. 15, No. 11, pp.1119 – 1125, 1994. M. J. Martin-Bautista, M. A. Vila, “A Survey of Genetic Feature Selection in Mining Issues”, Proceedings of Congress on Evolutionary Computation, pp. 1314–1321, 1999. Y. Freund, R. E. Schapire, “A decision-theoretic generalization of on-line learning and an application to boosting”, J Computer System Sciences, Vol. 55, No. 1, pp.119 – 139, 1997. R. E. Schapire, Y. Singer, “Improved boosting algorithms using confidence-rated predictions”, Mach Learn, Vol. 37, No.3, pp. 297–336, 1999. C. J. C. Burges, “A tutorial on support vector machines for pattern recognition”, Data Mining and Knowledge Discovery, pp. 121 – 167, 1998. Mitchell TM. Machine Learning, 1997. D. F. Specht DF, “Probabilistic neural network for classification, map, or associative memory”, In Proceeding of the IEEE international conference on neural network, pp. 525 – 532, 1988. U. R. Acharya, E. Y. Ng, J. H. Tan, S. V. Sree, “Thermography based breast cancer detection using texture features and support vector machine”, Journal of Medical Systems, Vol. 36, No. 3, pp.1503 – 1510, 2010. H. Ghayoumi Zadeh, O. Pakdelazar, J. Haddadinia, G. RezaeiRad and M. Mohammad-Zadeh, “Diagnosing breast cancer with the aid of fuzzy logic based on data mining of a genetic algorithm in infrared images”, Middle East Journal of Cancer, Vol. 3, No. 4, pp. 119 – 129, 2011. A. A. M. Yaneli, C. R. Nicandro, M. M. Efren, P. C. Nancy, A. M. H. Gabriel, “Assessment of bayesian network classifiers as tools for discriminating breast cancer pre-diagnosis based on three diagnostic methods”, In Advances in Artificial Intelligence, pp.419-431, 2013. M. C. Araujo, R. C. Lima, R. M. De Souza, “Interval symbolic feature extraction for thermography breast cancer detection”, Expert System with Applications, Vol. 41, No. 15, pp. 6728 – 6737, 2014.